Which is the Best Pair of Kitchen Shoes for You? As a mainstay in the kitchen, here are some of the reasons why you should get the best kitchen shoes for your type of work. Wearing proper shoes in the kitchen for chefs (video) will make you feel comfortable and relaxed as you do your work in the kitchen. If you have f﻿﻿oot pr﻿﻿oblems, wearing supportive footwear will help in alleviating your present condition instead of worsening it. Wearing the right type of shoes in the kitchen will minimize accidents – particularly, falling and slipping accidents. Practical – For practicality, get a pair of shoes that’s simple and lightweight. 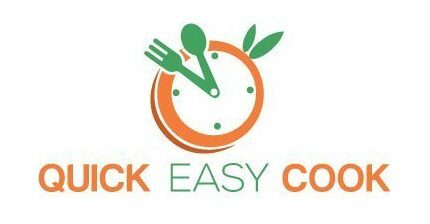 You want to move quickly in the kitchen whether you are preparing a meal for your family or a restaurant full of people. Don’t take your kitchen working shoes for granted. Keep the following benefits in mind. Healthy Feet – You won’t injure or damage your feet if you’re wearing the right type of shoes while performing your work. Even your posture will benefit from this – and of course, your overall health as well. You already know the importance of comfort when it comes to footwear. Now, consider the following things when shopping out to buy your kitchen shoes. Non-Slip Soles – Having slip-resistant shoes will keep you safe and comfortable all throughout the day. Aside from having peace of mind, wearing shoes with good traction will keep you balanced as you move around in the kitchen. If you’re particularly looking for some good options on Mozo Kitchen shoes, consider this model which made it to the #5 position in this Top 5 countdown. This men’s shoes can be used in a demanding kitchen environment. Materials – This model of shoes is made of synthetic leather materials. They’re easy to clean – just wipe the surfaces with damp cloth (preferably warm) and you’re good to go. Non-Slip – With its patented Spider Traction Max, the rubber soles have good grip on the floor. 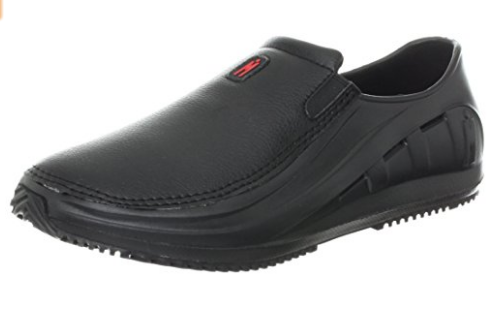 This is a good pair of shoes for chefs – it’s so comfortable that you can wear it for 8 hours straight without feeling fatigued. For some people, the arch support may not be enough – and if that’s the case, get insoles with the right amount of arch support for your feet. Since the insoles are removable, these can be washed and sanitized. You won’t slip when treading on wet and greasy floors because the soles are slip-resistant. This Mozo kitchen shoes for women make for a great choice when specifically looking for something to wear in the kitchen. Aside from style, this model also carries safety features which are essential in this type of shoes. Materials – This pair of shoes is made of leather materials. This is a comfortable pair of kitchen shoes and you can wear them for long hours. You don’t have to worry about slipping when treading on wet and greasy floors as the shoes come with good traction to keep you stable. Men and women will look good in this model of shoes from Crocs. 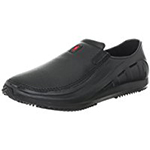 These non slip kitchen shoes can also be worn outside the kitchen. They’re your typical Crocs clog-type of shoes, you see. Style – This is a pair of slip-on style of shoes. Just like traditional Crocs clogs, the shoes are enclosed and there are adjustable heel straps. Insole Structure – The shoes come with massaging footbeds which are comfortable and healthy for your feet. 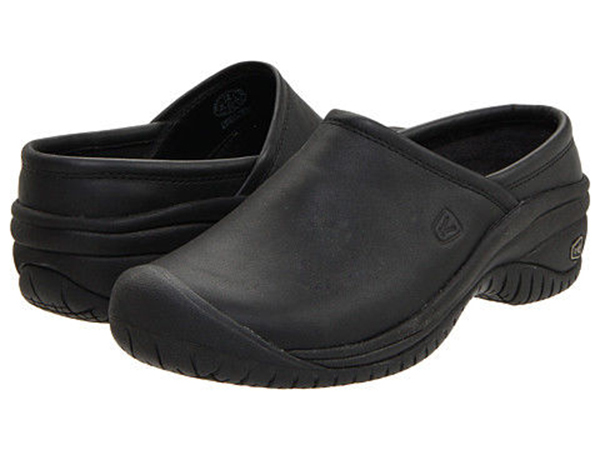 Well, you can rely on good old Crocs for your kitchen shoes – and this model is one of your best choices. Crocs Bistro 10075 Via KOObee goes shopping! 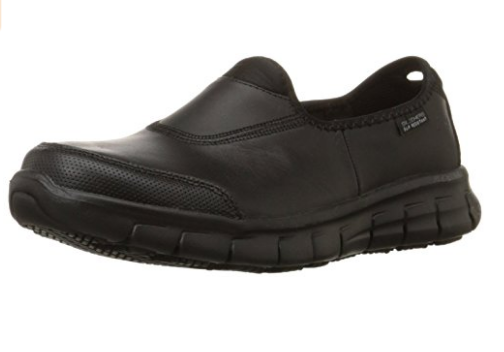 These Skechers kitchen shoes for men come with style and functionality. Although the shoes come with a few flaws, this model is still an option to consider when looking out for a reliable footwear in the kitchen. I like it a lot – that’s why it’s positioned at #2 in this Top 5 list. Because of the shoes’ non-slippery features, this makes for a good option when looking out to buy a pair of kitchen shoes. This model is also stylish and good looking – so, you can also wear it casually (out of the kitchen). To all the women out there, do consider this model of shoes from Skechers as your kitchen working shoes. It nabbed the Top 1 position in the Top 5 list because I found it to be the most suitable footwear in the kitchen. If you’re constantly working on wet and greasy floor, this pair of shoes makes for a great option. You will feel comfortable and safe all day while working in the kitchen. I hope the reviews of the Top 5 Best Kitchen Shoes for 2019 helped you in choosing the right type of shoes for you. But let me make a few more suggestions to further help you out. As you can see in the Top 5 list, I am recommending the Skechers shoes for men and women (they are number 2 and number 1, respectively). Well, we all know that Skechers is a reputable brand (video) – and the models I chose for the Top 5 are all suitable as kitchen shoes (not to mention stylish). 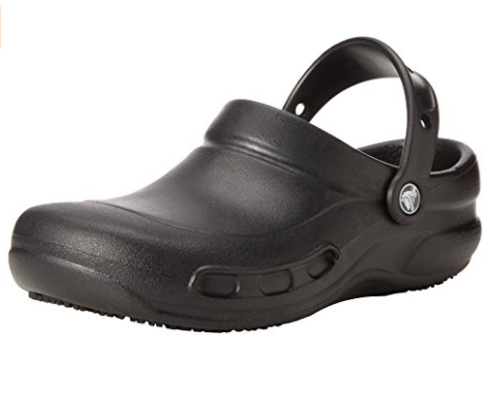 The Crocs shoes which made it at the Top 3 slot is also a great pair of kitchen shoes – I highly recommend it, too. Like Skechers, Crocs is also a well-known brand and they’re known for their durability. The model I included in the Top 5 list is unisex, so men and women will look good wearing them. For the Top 5 and Top 4 slots, these were taken by 2 Mozo kitchen shoes. The Mozo Shoes Company is a part of the Deckers Corporation – which, of course, is a giant in the footwear industry. Mozo, in particular, is gaining popularity because of their culinary footwear designs (video). And your 2 Mozo choices in the Top 5 list above are good choices for kitchen shoes. I suggest looking closely into the different features of the shoes presented in this post. Weigh the pros and cons of each pair before deciding on which shoes to buy. Remember, you have your own individual requirements and preferences in your kitchen shoes, so choose wisely. Let me know how it goes in the kitchen, ok? You can leave your message in the comment box below. And if you feel like sharing this article with your friends, then go ahead and share it. 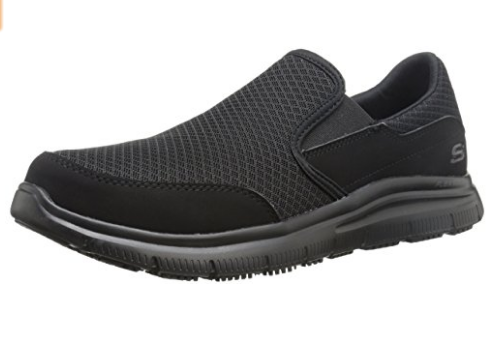 For more chef shoes for sore feet, flat feet, wide feet and plantar fasciitis, click here.